Situated on the Eastern Mediterranean and surrounded by sea on three sides, Turkey enjoys long, hot summers and short, mild winters. The most popular time to visit is between April and October when the weather is perfect for relaxing on its beautiful sandy beaches or enjoying the lakes and mountains. Many mediterranean regions do not have the infrastructure that many disabled or special needs tourists would be used to in Western Europe or the USA for example. However, awareness is growing, and increasingly more hotels and resorts are catering for special needs. Unfortunately, at present, these tend to be the more expensive hotels and resorts, but if you are on a budget you should contact us and we can advice you of hotels with easy access ramps and lifts. The larger resorts and hotels have wheelchair access and facilities as good as any in the world, with purpose built suites with bathrooms and toilets for the handicapped and physically disabled. All flights are approximately 4 hours away and most flights are available from local airports, depending on the time of year. Turkey is steeped in history and the Antalya province is no exception. In this Mediterranean enclave, beaches and a lovely marina vie for attention with the picturesque streets of Kaleici, the old town center which has been extensively restored to produce an intriguing blend of ancient architecture and contemporary attractions. 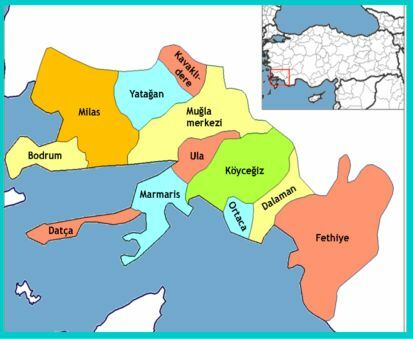 The coastal districts are; Antalya, Gazipaşa, Alanya, Manavgat, Serik, Kemer, Kumluca, Finike, Kale and Kaş. 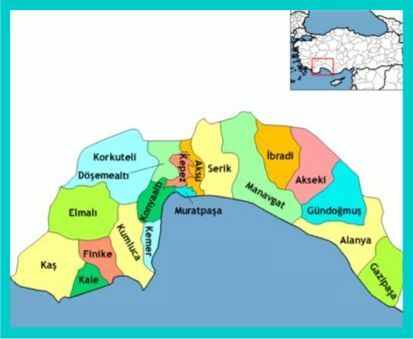 The provincial capital is Antalya city with a population of 714,000. The picturesque capital city is noted as much for its ancient ruins and prize- winning archaeological museum as it is for its hotels, restaurants and lively nightlife. Shops, bars and restaurants line the narrow streets while the imposing Hadrian's Gate, dating back to 130AD, provides an archway to its ancient past. Situated on a shoreline dubbed the Turkish Riviera, the region also has a great deal to offer in terms of sand, sea and relaxation. The coastal resorts of Alanya and Kemur, among others, are well worth exploring for their natural beauty alone. If you are staying in Antalya there are some must sees in the area. Stroll around the old city area of Kaleici and then down to the marina area with its nice little tea houses etc. Take an afternoon or morning exploring the Antalya museum. Get down to the Beach park area some nice restaurants. Have some beach time either on the Konyaalti side or Lara Side. Go shopping...Shopping in Antalya is super too from the big shopping malls like MMM Migros to the small shops and kioks in the Kaleiçi. Take the kids to the Aqua Park. Visit the Mini-city located on the Konyaatli beach front just down for the Hillside Su hotel and Aqua Park. Also across from the Migros shopping mall is the large amusement park called Luna Park. Marmaris is a port city and a tourist destination on the Mediterranean coast, located in southwest Turkey, in the Muğla Province. A gorgeous backdrop of pine-clad mountains looms behind the seaside resort of Marmaris in southwest Turkey. Popular as a cruise ship and yacht port and with the British budget holiday crowd, Marmaris offers an abundance of fast food restaurants, the restored castle of Suleyman the Magnificent and an appealing cobblestoned old quarter. Bars and restaurants line the marina. Outside the busy town, coves and bays of the Datça Peninsula make lovely daytrip destinations for those traveling by boat. There's lots to do in the Marmaris. Take a walk on the prominade to Icmeler or Marmaris, visit local markets, visit a mosque, catch local transport or hire a car to Turunç, Akyaka, Datça, Mesudiye, Palamutbükü, Ovabükü, Söğütlü, Bayır, Orhaniye, Selimiye, or Bozburun villages. Take a water taxi to Turunç or Kumlubük for a day out... don't forget to pack your beach bag. You can do many of the above day trips under your own steam. Must have is a Turkish Village Breakfast in a reputable restaurant. If you have kids try Asparan restaurant which has a childrens playground in Degirmenyanı. Towards Çamlı village there are a few of these breakfast experts like Çınar, Saklıgöl, Azmakbaşı or Halil Restaurants.